BladeBond Extreme is a high performance aerospace grade adhesive designed to excel where most other consumer grade epoxies fail, namely in peel strength and service temperature. BladeBond Extreme boasts high peel and shear strength, and an incredible maximum service temperature of -55F to +240 F. The Extreme formula was developed for high abuse environments, such as tactical/military and survival/bushcraft applications. Because of its exotic raw materials, BladeBond Extreme is somewhat higher in cost per application. However, we are unaware of an adhesive system that offers these unique physical properties in small quantities to the custom knife maker. 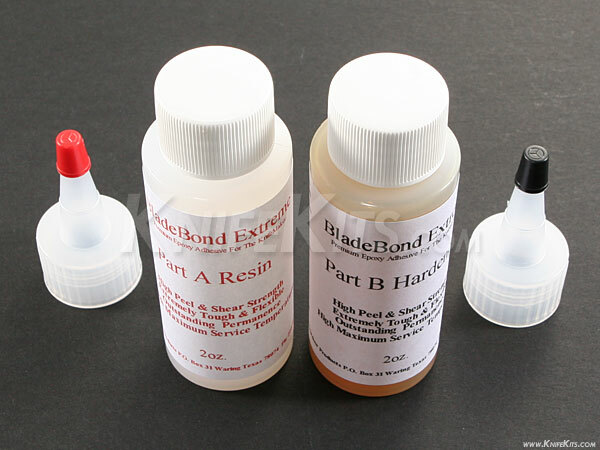 Note: BladeBond Extreme has a 1 year shelf life, and for that reason will currently only be offered in 4oz. kits. Lap Shear tests performed on Wood to Steel yielded substrate failure prior to bond failure.